I use micronucleus in a configuration where it only starts when the button is pushed. This means that the user program is started without a delay after the device is powered up. Since the hardware reset input is now disabled, the functionality of the reset button has to be emulated in software. This is possible by periodically polling the state of the button and activating the watch dog timer if it is pressed. If the watch dog times out, the device resets. When the watch dog time out is set to 0.5 s or 1 s, a reset is only asserted if the button is pressed for a longer duration. In this mode is it possible to use short button pushes for user interaction without resetting the device. 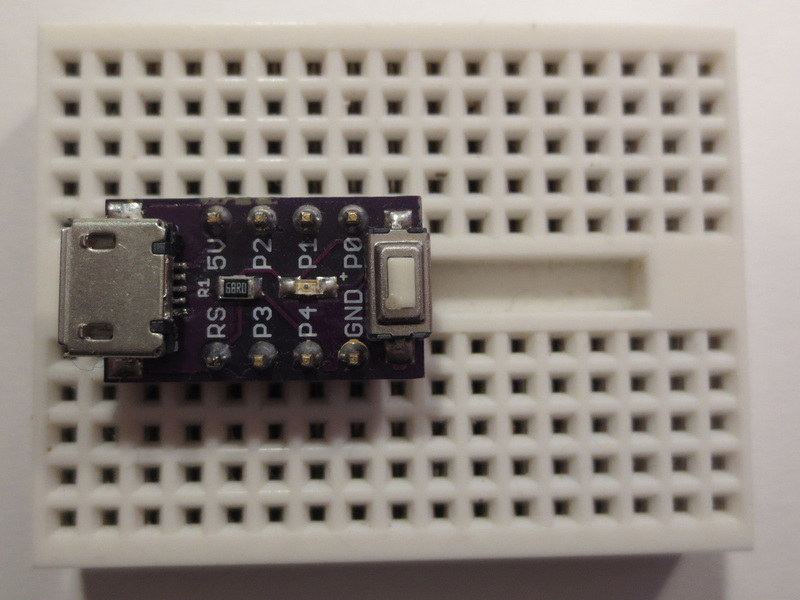 Apart from the LED output, user interaction and soft-reset button, PB5 can also be used as a simple serial debug output. 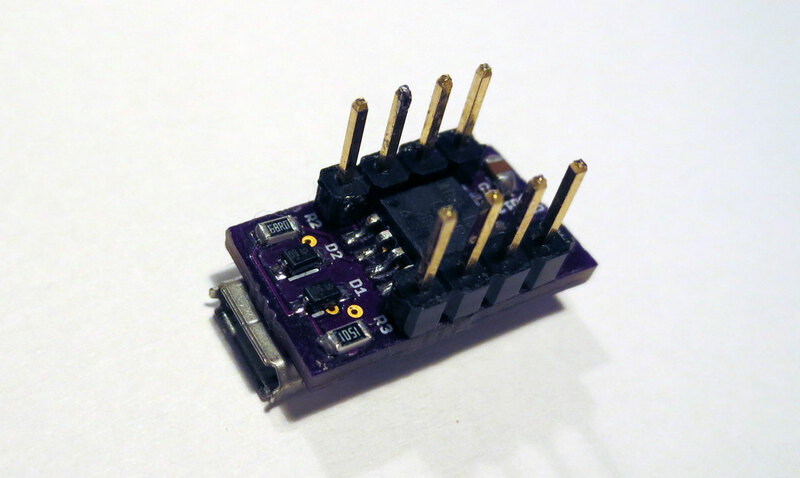 While there is USB debug functionality in the Digispark, it can often not be used due to resource constraints or when you want to use the USB port for a different functionality. In this case, PB5 can be connected to the RX input of a serial to USB adapter. I use a simple software-UART implementation and a macro to redirect STDOUT to the serial output. This allows very convenient debugging with printf(). The Eagle design files and example code can be found in the Github repository. Build your own! Edit: I added the BOM to the Github repository. You can now actually buy the Nanite 85 at Watterott. Get one here. It looks like you might be able to shave another mm of the length by moving the USB connector back. When you have reset disabled, do you just unplug the USB in order to reset it? Looks like I forgot some parts of the article – it had been sitting in the queue forever. I revised it. This is a great design. Do you happen to have a BoM of the parts your board is designed for? Thanks! I would also like to second the BOM request. If you get any made up Ian I might buy a few off you. Kevin, I was thinking last night of putting together a NashMicro group buy and through together a quick price quote last night. For qty of 100 there’s a parts price of about $7 before shipping. It makes it pretty hard to justify the effort vs. just buying a Trinket for $7.95 and you give up mounting holes. I may still do it just because of the uniqueness of the board but, unfortunately, its hard to find a practical reason to do it yourself unless you just have the parts lying around. Watch NashMicro.net for a post if I decide to pursue it. Thanks for your interest! I added the BOM to the github repository. Btw, if you buy the electromechanical parts from China (Aliexpress, ebay) and the rest from Mouser/Digikey you’ll end up far below $5/pc. Nice one, I’m thinking about replacing the resistor and led by a WS2812 (5050) LED. Where did you get the pcb manufactured? Neat idea. But also the pin description has to go then. 5050 LEDs are huge compared to this 0603 one. Hello, great little design! 🙂 Is it enought to upload just the brd file (from the github) to this purple PCB place? 🙂 Will it produce a correct, functional PCB? I tried that, and for me it seems to be ok, but I’m not very experienced with these kind of things. Thank You! yes, the .brd file is all that’s needed. Well, this one is missing a proper I/O headers and lacks the USB port? Also no reset button. The key is not only getting it small, but also retaining or even adding functionality :). Btw, there is a type of USB micro-b socket that has two pins for alignment. Those are much easier to solder. 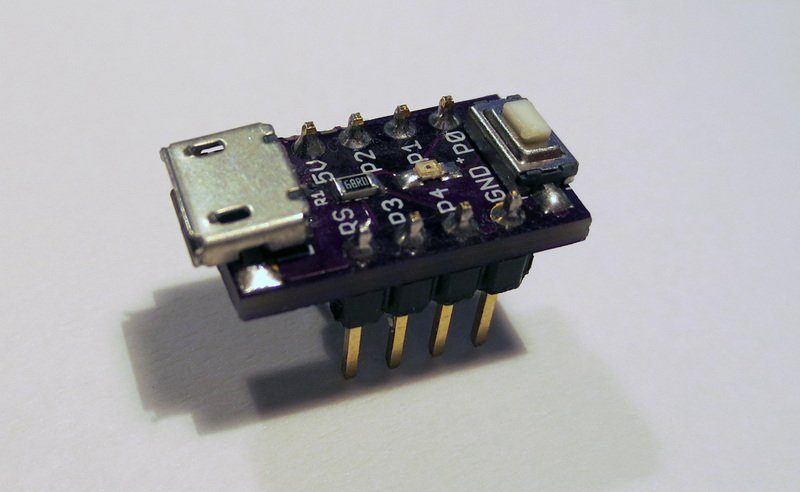 Do you have Digi-Key or Mouser part numbers for the USB micro-b socket and the switch? Ebay links would work as well. However I can’t source the zeners (at least not without $40+ shipping fee), could somebody suggest some alternatives? I know the V-USB are sensitive to these zeners, so I would not want to mess up something. Are these usable: NXP BZX384-C3V6? I already have the boards, and seems to me, that microMELF should fit too, maybe this: BZM55C3V6? But this one is 0.5W. Any 3.6V Zeners should do. They are not loaded that much. If you have diodes with a different footprint you could try adapting the lay out. Thank You for the info. I already have the boards, so I need to find zeners, that will fit. Do you have the board available on OSH Park? Sorry, no. But since the .brd file is provided, you can order it very easily on OSH park. Great project. I am a Trinky before and thats works fine as it uses PB1 for the LED and your have to reset for it to goto bootloader mode. But is a little bit confuse by which micronucleus to use for Nanite? There are four .hex file (v1.11) from the micronucleus link, which one should I use? Many thx for a awosome projects! is that correct and all i need to do ? This one will work if you have reset disabled and have a button on PB5. Otherwise check what I wrote above/below. Thanks I try the one without appendix and it works. I left the RESET pin enable, as I am not brave enough (just in case I brick it). and 3.9v zener diodes instead of 3.6v zener diodes. I can’t tell if these components work with your computer, but chances that they do is high. The best thing you can do is to try. The example is a normal C program, not Arduino. You need Atmel studio or the bare AVR-GCC toolchain to compile it. thank you for the response. i installed the avrplugin into eclipse ide and now i can compile it. can you provide me some hint about eclipse/board configuration to upload the device using bootloader (even if is still possible)? You can use micronucleus to upload the .hex file from the shell. I don’t have an eclipse configuration ready, sorry. I apologize for my incompetence. i can not find any help nowhere. now I’m able to compile using atmelstudio 6.2. the goal is to use pb5 as serial output for debug. after uploading NaniteExamples.c the cpu seems reset continuously. at first moment i had supposed that was a consequence of “F_CPU not defined for ” warning. I added the definition F_CPU = 16500000L and code to get square wave in order to check with oscilloscope. the timing is correct only if remove nanite_pollin() function but anyway nothing coming out from pb5! You can only use PB5 if you disabled reset using the fuse setting. Otherwise it is advised to change to another pin.